The chain barrier to easily mark off parking places and driveways. Chain barrier for passages up to 20m. TECNO CAT MASTER Gearmotor 24 Vdc with encoder. On-board ACTION control unit with slowing-downs both in opening and closing phases. 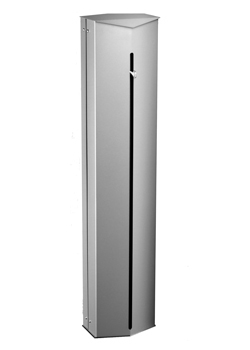 Pillar height 1010 mm. TECNO CAT SLAVEGearmotor 24 Vdc. Pillar height 1010 mm. We inform you that as from the beginning of 2016, the coating surface of the column TECNO CAT casing will vary, in order to further increase the quality of the product. The new coating will be of type "textured finish", rather than smooth like the present one. The change will allow an improvement of the aesthetics of the product and will ensure a better robustness to small scratches and marks due to handling during the installation process. This kind of varnish will also enhance the aging effect, keeping longer the original color. Strong, fast and safe barrier for car parks. 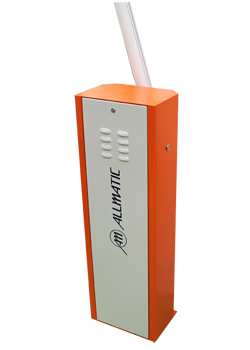 Street barrier for bars up to 6 mt with opening time from 1,5 to 6 seconds. 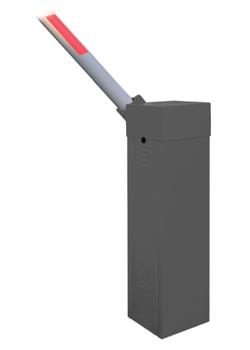 BRT SIMPLE Street barrier 230 Vac with on-board control unit for bars up to 6 m with opening time from 2,5 to 6 seconds. On-board BIOS1 control unit with radio receiver, slowing downs, safety devices and managing of a transmitter through the display. Backing plate, bar and clamp hub are needed. Strong and safe barrier for passages up to 6m. Road barrier for bars up to 6 m.
BEVK4 24 Vdc road barrier with SCOR.AS control unit series on board, maximum rod 4m. Backing plate and bar are needed. BEVK6 24 Vdc road barrier with SCOR.AS control unit series on board,rod 6m.